According to a review of espresso makers in early 2007 by a leading consumer magazine, “If you want a tasty cup of espresso with minimal hassle, the Nespresso C100 is the machine to buy.” Ideal for those love espresso drinks but don’t want to be bothered with the mess and and time of the traditional coffee grinding, brewing and cleanup rituals, the Nespresso C100T uses pre-filled capsules to consistently produce a tasty espresso every time. Owners uniformly rave about the quality of the coffee produced by the unit as well as the exceptional convenience factor. That convenience does come at a price, however. 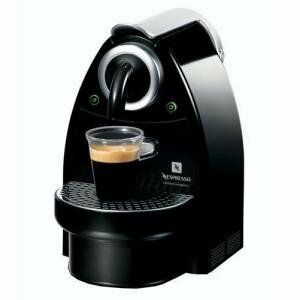 While the unit itself (discounted prices at around $200) is quite competitively priced for a pump espresso machine, you must purchase the coffee capsules directly from Nespresso, the cost of which is roughly double what you’d pay for loose coffee. Still, if convenience and consistency is what you’re after, you’ll find the additional cost worthwhile. Nespresso offers a dozen varieties of coffee, including decaf — a sampler is included with the unit. The unit actually generates the highest pressure among the units we’ve reviewed — 19 bars, and the resulting espresso is full-bodied with a rich crema layer. After loading a capsule into the machine (and making sure the 34-ounce removable water reservoir is sufficiently full) the unit brews quickly at the push of a button. Used capsules are ejected into a collection container. The unit is very small, making it ideal where counter space is tight.